What power do Scots really have now? The SNP’s Westminster success is undoubtedly headline grabbing – but in practice it delivers little to Nicola Sturgeon and, more importantly, nothing for Scotland. With Labour performing so poorly south of the Border as well as north, Ms Sturgeon’s plans have been frustrated. Far from “mischief-making at Westminster”, the SNP is rendered impotent. With an overall majority, David Cameron doesn’t need to barter with Alex Salmond over home rule. At his acceptance speech, the Prime Minister made clear he will promptly implement the outcome of Smith Commission. Alex Salmond can bluff and bluster all he likes but the SNP hasn’t enough power at Westminster to demand anything more. More worryingly for Miss Sturgeon, in a campaign in which she insisted ad nauseam that the general election was about “austerity not independence”, she failed to secure more than 50 per cent of the vote. Half of the vote is no mean feat but the First Minister will realise that many who supported her call to end Tory cuts would not back her in a referendum. And let us not forget that 50 per cent of the electorate also voted for non-separatist parties. Undoubtedly the 2016 SNP Holyrood manifesto will include the right to request a second referendum if the UK votes to leave the EU, though an EU exit seems far from certain. None of this provides Miss Sturgeon with an easy route to her number one goal: independence. Of much greater immediate significance for all of us is that the SNP landslide means Scotland is virtually excluded from any role in Westminster. The 56 SNP MPs will neither form part of the government nor the official opposition. This large block of SNP seats, far from delivering Scotland the stronger Westminster voice Miss Sturgeon promised us, will instead ensure Scotland becomes marginalised in UK politics. Miss Sturgeon’s gain is Scotland’s loss. Nicola Sturgeon was correct to state that even a landslide victory for the SNP in the Westminster election would not be a mandate for Scotland to claim independence, or for another referendum. 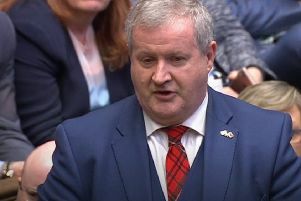 Having said that, however, 56 seats and 50 per cent of the vote does give the SNP a mandate to call for delivery of the maximum devolution, by way of quasi-federalism or “home rule” that the Scottish electorate clearly seeks and which was promised in the final days of the referendum campaign. It should be noted by those who in the past claimed to speak for the “vast majority” of the people of Scotland in opposing the SNP and even the holding of a referendum, as well as by those in the media who have not expressed balanced perspectives, that following the referendum there has been a fundamental shift in UK politics. The SNP leadership should also recognise that it now has been entrusted with even more responsibility to assiduously represent views across the political spectrum in Scotland and to be a positive, as well as a progressive, voice for change across the UK. Constructively leading the debate for electoral reform of the House of Commons and the House of Lords, while enhancing the Holyrood committee system to set even higher standards of democratic representation in Scotland, will pose considerable challenges, but I personally am confident that Nicola Sturgeon, supported by strong SNP teams at Holyrood and Westminster, can progress the wishes of the majority of people across Scotland and the rest of the “British Isles” by inspiring us to work together to achieve a better future for all of our children. The winner of the UK general election is clearly the Conservative Party. David Cameron and the one in six Scots who voted for him must be happy. However, while I am sure the Prime Minister will be thanking his Scottish Conservative colleagues for their support, I am certain he will also be grateful to Nicola Sturgeon. Not only did the SNP help virtually wipe out Labour in Scotland, they also helped drive voters to the Conservatives in England by claiming that the SNP would hold undue influence over Ed Miliband. The Conservatives were being fed lines by the SNP at a rate faster than they could design leaflets and posters to print them on. So much for Ms Sturgeon’s pledge never to help the Tories. The Conservative majority means that they can pursue their ideologically driven plan to reduce the size of the state without having to compromise with the Liberal Democrats. The SNP have only two alternatives to this. The first is for Ms Sturgeon to claim the SNP majority in Scotland is justification for scrapping the Barnett Formula and implementing the full fiscal autonomy proposal outlined in their manifesto. This is an idea so bad that only Alex Salmond and Boris Johnson appear to be fully behind it. The other alternative would be to respect the outcome of the independence referendum and fully implement the Smith Commission proposals. This gives Holyrood the ability to take a different path from the rest of the UK, or perhaps even lead it. By using the tax, welfare and borrowing powers sensibly the SNP government could, at long last, start reducing inequality in Scotland rather than investing time in endless constitutional politics.